As one of our projects for Earth Day, we experimented with fusing HDPE and LDPE plastic grocery bags into sewable fabric. The only logical thing to do once we’d succeeded at making fabric was to create actual garments from the material and enter them in a fashion show. We were able to submit an entry form for the annual EPA Earthfest Recycled Fashion Show just before the deadline. This is a runway fashion show judged by a panel of local fashion experts including Shirin Askari, a former contestant on Project Runway. Steve Rainwater coordinated a team made up of makerspace members, local fashion designer ALi Em, and models Zamra Dollskin, Wendy Messner, and Sarah Ann Chartrand. We fused lots of plastic, ALi designed cool outfits, and our models looked great wearing them. In the end Dallas Makerspace took First Place in the Non-College Category! To read more about how we fused recycled grocery bags into fabric see our Recycled Plastic Fabric project page. To read more about the outfits our team put together for the show, see our Recycled Fashion Show project page. 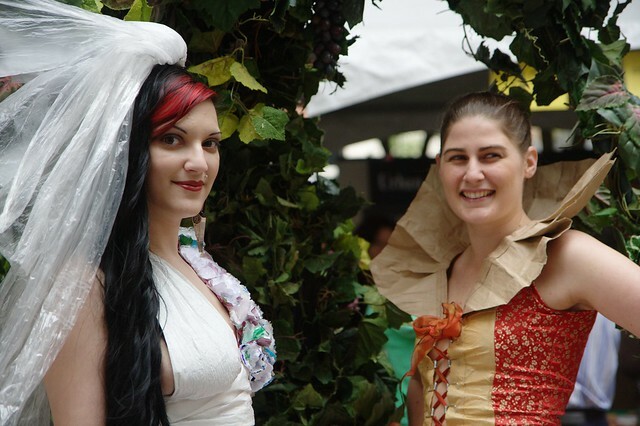 And to see lots of photos of the models and outfits, check out Steve’s EPA Earthfest Recycled Fashion Show photo gallery. Last night’s meeting – Kite photography this Sunday!